SUZHOU, China, June 20, 2018 /PRNewswire/ -- Chinese bio-pharmaceutical developer, manufacturer and marketer of oncology drugs TOT BIOPHARM announced recently that its second phase project, a monoclonal antibodies (mAb) production site with 16,000L capacity, was inaugurated in Suzhou Industrial Park in May 2018. The 13,000-square meter facility will be capable of meeting all-around demand from the biopharmaceutical sector for upstream research and development, pilot-scale production, clinical trial drugs production and commercial production. With the new facility, TOT BIOPHARM will also be able to produce both biologic drugs and small molecular drugs at commercial scale. Attendees at the ceremony included Suzhou municipal standing committee member and Suzhou Industrial Park party secretary Wu Qingwen, accompanied by leaders of the party working Committee and the administrative committee, among them, Sun Yanyan, Han Jiang and Zhu Jiang. TOT BIOPHARM Company Limited, established in Suzhou Industrial Park in 2010, is a high-tech enterprise specialized in the R&D, production and marketing of innovative oncology drugs. The company has established an industry leading anti-tumor drug technology platform, developed multiple series and varieties of antitumor drugs and formed a high-quality product portfolio. 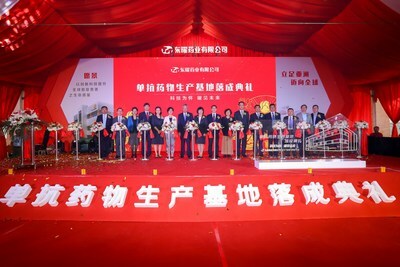 The first phase of construction for the specialized cancer drug production base, including 500L-biologic pilot plant , OEL-5 isolator for ADC, BSL-2 certified viral facility, and small molecule plant (2 oral and 1 injectable plants), was completed in 2012. In a move to enhance the company's production capacity and further meet the demand for oncology drugs worldwide, TOT BIOPHARM broke ground on the construction of the second phase for a mAb production base in 2016. The new facility integrated advanced biotechnology and high-end manufacturing technologies in tandem with upgrading existing equipment, processes, products and quality standards, and will include a production line of pre-filled preparations and a commercial scale lyophilization area for antibody-drug conjugates (ADC). The production capacity of mAbs is on track to be scaled up to 16,000L, making it one of the largest such facilities within China's biopharmaceutical industry. The factory is expected to provide high-quality yet affordable drugs to patients, acting to cut the country's medical costs while enhancing the global competitiveness.